The Microturbo Cougar 022 Jet was used in Turana target drones which were in turn developed from the Ikara missile. The Turana was designed to use the same lunch system as the Ikara and built to survive 10 flights. 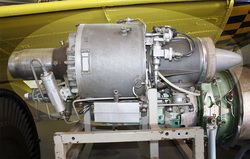 The engine was designed for 20 missions including seawater immersion. It was able to be recovered after a mission by parachuting into water.